The European Benny Goodman recorded more than 550 tracks, but nowadays he's unknown to most of the people: Ernst Höllerhagen. 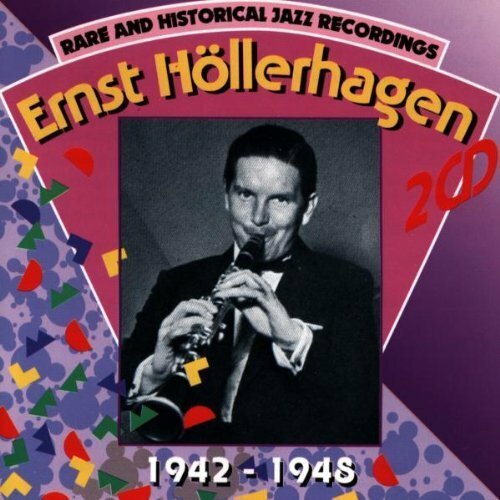 Ernst “Ernie” Höllerhagen (October 5, 1912, Barmen, Germany – July 11, 1956, Interlaken, Switzerland) was a German Jazz clarinetist and saxophone player. He also played violin and accordion. As a 13-year old boy, Höllerhagen already accompanied silent movies with the violin in a cinema orchestra and was considered a child prodigy. After his education as clarinetist, he played in several dance orchestras. In 1932, as a 20-year old, he was chosen to be the best saxophone player in Germany and critics named him the European Benny Goodman. He then often played with Dutch bands and from 1939, he was one of the soloists of the extended “Die Goldene Sieben”, a famous German dance orchestra in the 1930s which was supported by the Nazis. During WWII, he lived in exile in Switzerland and for a while he led his own band, including the rhythm section of the former Teddy Stauffer Orchestra: Buddy Bertinat (piano), Gene Favre (bass) und Polly Guggisberg (drums). There, he also met Hazy Osterwald and Höllerhagen played in his orchestra from 1947 until he unexpectedly committed suicide in 1956. At a concert in Copenhagen, Benny Goodman was very impressed by the virtuosity of Ernst Höllerhagen. In 1949, Höllerhagen performed with Hazy Osterwald and his Sextett at the first international Jazz Festival in Paris, where he also met Charlie Parker. He also did recordings with Willie Lewis (Höllerhagen played in his band in Switzerland during WWII) and with Coleman Hawkins. The encounter with Hawkins in 1936 in Switzerland was Höllerhagen's most important one, he declared. Overall, Höllerhagen recorded more than 550 titles. Although he was very popular because of his extroverted merriment, he suffered depression and he had alcohol problems. His wife left him to move to the US with their daughter. In 1956, he also had health problems and his future as a musician was insecure. In the same year, he hanged himself in Interlaken, Switzerland. It seems, that the song is currently not available in the U.S. and other countries. Sorry about that.